Strengthening the family and caregiver relationship. In today’s fast paced world people expect access to information wherever and whenever they need it. This includes information about their loved ones who are being cared for in Long Term Care settings. Your facility needs the tools to keep the communication between a family and their loved ones care team flowing. Luna’s FamilyConnect can update the family circle quickly and securely in a HIPAA compliant solution. FamilyConnect helps bridge the gap with family living locally and across the country, as well as across languages. FamilyConnect also allows you create custom surveys that family members can complete, giving you valuable feedback on their experiences. Automated surveys for admission and discharge as well as other occasions can be created, in addition to the standard ones Luna provides. 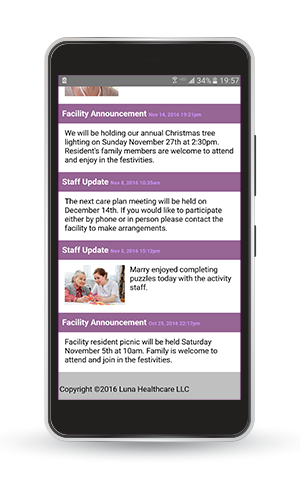 Luna’s FamilyConnect can be integrated with your other software solutions to automate the sharing of data with the resident family. You can even customize FamilyConnect with your logo and colors. It can also be integrated to your current website for a branded experience, or you can use it right away from our website. Please contact us for more information regarding integration or branding options. FamilyConnect is the affordable way to streamline your healthcare communication.